Whitewater rafting and camping trips for two and three days on the Salmon River of Idaho outside of Riggins and McCall Idaho with Salmon River Challenge. Is it time to slow your life down? Transition to river-time and let your schedule be dictated by the movements of the sun and water: wake up with the light, not to your alarm; instead of breakfast served at 7, it's breakfast served when ready; you'll know it's time to go on the river when the boats are loaded, that it's time to stop when we get to camp; and at day's end, let the transition from sunset-to-starrise set you on your way to bed, or else stay up a while and fall asleep by the firelight. Multi-day river trips are about slowing down and savoring the small stuff--taking in sunsets with your loved one over a bottle of wine and splashing around with your kids in the Salmon River's warm water. That's what these escapes into the river-life are all about. So join us on one of our multi-day camping trips and experience life as it should be: a little slower, a little easier, and a whole lot more fun. On our multi-day trips, all you have to do is show up for the river; we do the rest. Trips include everything you need with meals, camping equipment, beverages and all. Look forward to multi-course meals with treats fresh out of the dutch ovens and off the grill. Basically you just need to show up and enjoy your escape, enjoy the whitewater, the scenery, and most importantly enjoy those friends and family you bring with you. To help make sure you find the ideal experience we have two different options to choose from. First is a 6-day trip through the incredible Grand Canyon of the Salmon River, also known as the Main Salmon or River of No Return. We also have the 4-day Canyons of the Lower Salmon River. Both trips offer unique charm and experiences so please don't hesitate to call with any questions. The Grand Canyon of the Salmon River is a float through the largest contiguous wilderness area in lower 48 states. The canyons are deep and the walls steep creating a unique feeling of remoteness and escape. This adventure includes floating through the second deepest canyon in the United States, exploring historic homesteads, paddling through thrilling whitewater, camping on majestic beaches, sharing meals with friends while watching incredible sunsets over the river, and sleeping under a sky of incredible stars. Trips here are the kind of adventure your kids will remember 30 years later as one of the great family adventures of their life so grab the kids, find a date, and come escape with us on the Main Salmon River. This Itinerary assumes you are using our standard Boise to Boise transportation option. If you are driving to Idaho or traveling from Salt Lake City please call us about alternative logistic options and possible price reductions. Day 0 - The Day BEFORE your trip launches on the river: Meet at the Gem Air desk at the Boise airport. Please check in before 1:30pm. After your 90 minute flight the group arrives in Salmon Idaho where we load the bus for a 2 hour drive into the wilderness. When we arrive at the put-in its a short jet boat ride across the river to the riverside lodge for the night. The stay at the lodge, the flight, and bus ride are included in the price. After a detailed trip orientation the group begins our adventure downriver. Stops today include a historic homestead with a feral orchid great for walking around and exploring. The day also includes numerous fun class II and III rapids along with some optional hikes and stops to see Native American pictographs. Tonight includes river-side camping on one of the many incredible beaches. The whitewater takes off today with one of the more challenging rapids of the trip, Black Canyon Rapid. This thrilling ride through big waves is hidden deep in the heart of the "Black Canyon" an incredible granite gorge. Not long after the rapid its time to soak in Barth Hot Springs, one of the most incredible hot springs you will find anywhere. Tonights camp in another wonderful riverside beach, likely with some great hiking options. More whitewater with a number of class III and even class IV rapids. If on a July trip with a lodge in the middle of the trip, tonight is the night for a hot shower and sleeping in a bed. The stop at Whitewater Ranch is an incredible mid-trip stop where you can explore the home of modern day frontier living. For those on August 6-day full camping trips tonight is another amazing riverside camp. More thrilling whitewater with one of the longest rapids on the entire Salmon River followed by a stop at a beautiful homestead site where you can explore the remnants of cabins from the homesteading generation of a century ago. The afternoon brings the group into a favorite trip stopping point, Buckskin Bills. Buckskin was one of the last great american mountain men this was his homestead on the river. The group will watch the short documentary highlighting the weapons he made by hand before taking time to sit in his cabin and climb his turret which he made to fight off the government. It’s also a great place to grab an ice cream, sit in the shade and watch the river float slowly past. Many great sand volleyball games have happened on the large beach at Buckskin Bills. After buckskin bills it’s probably not far to your first great riverside camp. Into the heart of the Grand Canyon of the Salmon River. The second deepest canyon in the United States, deeper then the Grand Canyon of the Colorado. The Salmon River canyon is an ideal place to put your feet up and float while taking in the steep rock walls and the mountain sheep climbing the pinnacles above you. Whitewater is reasonably mellow today but swimming holes are abundant as the group floats to a wonderful, white sand beach camp for the night. Tonight will be a delicious dinner to celebrate a wonderful trip down the beautiful Salmon River. Stay up late and take in the stars, because you won’t see them anywhere else like you will see them on the Salmon River. End the trip with a bang. This morning is great! These will be the biggest rapids of the trip and they include Dried Meat, Chittum, Vinegar, and Carry Creek Falls, all of which are spectacular. The group arrives at the trip takeout sometime around mid-day for a late lunch. From the takeout it’s about a five hour drive on the shuttle van back to Boise. The Canyons of Lower Salmon River in Idaho just might be the perfect family rafting trip. Warm water, great weather, white sand beaches, exciting rapids and incredibly friendly for those younger first-time rafters. We see lots of 5-10 year olds on this trip from mid-July to the end of August. It’s the full package for family fun. No lines to stand in, no hidden costs to pay upon arrival, no crowds, no internet, no cell service. If you’re family is looking for the trip they will all remember forever, this is it. River time on the Lower Salmon is splashing through rapids, surfing the kayaks, swimming in the pools, and maybe throwing the football on the beach at lunch. It’s filled with awe inspiring scenery, quiet conversations with your kids and lots of laughter. A good Lower Salmon river day includes more than one cheer of accomplishment at the bottom of a rapid and a priceless smile on your daughter or son who just paddled through a rapid they did not think they could. It’s about traveling as a family, succeeding as a family, reconnecting as a family. 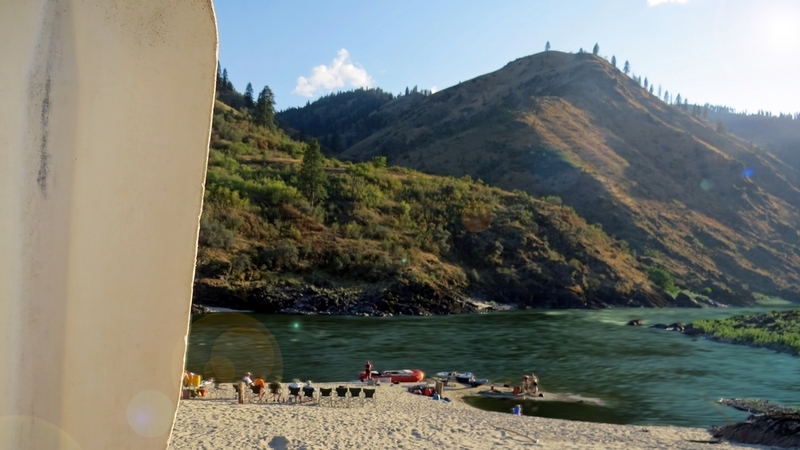 At the end of every day on the Lower Salmon River camp arrives on a riverside beach. Camp time is the chance to find your tent and the cot inside for a little afternoon nap or just spend the afternoon swimming in the river with the kids. If your family likes a little competition grab the bachee balls and play a round. Regardless of how you choose spend the afternoons a few things are sure to happen. This time with your spouse or kids won’t be interrupted by any type of social media or work beep on a phone. You will have sand between your toes and a smile on your face. You will be asked, “would you like another drink and perhaps some more cake” after dinner. Your kids will fall asleep under an impressive sky of stars. You will go to sleep with the quiet sound of the river flowing in the distance. Day before start date: Fly into Lewiston, Idaho. From the airport take the hotel shuttle to the Red Lion Hotel. At 7 PM we will have an orientation meeting in the lounge area of the lobby. At the orientation the Head Guide will talk about what to expect, give some river history, answer any last minute questions, and hand out your equipment, including your clothing bag. Day 1: Meet your Head Guide in the lobby at the assigned time. It’s important to eat breakfast prior to meeting as it will seem like a long time until lunch. It is a two-hour bus ride to the put-in for the trip. When the group arrives at the put-in, the remaining guides and all of the river equipment will be waiting to meet you. Hop out, load on the sunscreen and get ready for some Lower Salmon fun! The Head Guide will give you a thorough safety and paddling orientation before you climb in your river craft and take the first strokes down stream. We begin the Lower Salmon with great rapids like Roller Coaster and Big Foot Island before your first riverside lunch prepared by the guides. After lunch, we enter Green Canyon and the biggest whitewater so far. Rapids like Demons Drop and Right Way are a great introduction to what the next three days have in store. Camp will be on one of the many big Lower Salmon beaches where you can swim, throw the Frisbee, or just relax with a drink while your guides prepare a delicious three-course meal. Day 2: Start the day off right with a hot breakfast and fresh baked cinnamon rolls. A nice morning with some fun rapids leads to Cougar Canyon, where more whitewater awaits. After navigating Upper and Lower White House, the group will pull to shore and spend the rest of the day re-running, swimming through, and trying to surf the waves of Lower White House rapid. This is a great time to shoot video of the kids trying to surf or swim through their first rapid. If you have youngsters who have been riding the raft, this is a perfect opportunity to let them go in the front of your inflatable kayak or a guides and hit some waves from a Torpedo. Day 3: Wake up and get ready for whitewater! Today boasts the most exciting whitewater of the Lower Salmon including two Class IV rapids. The morning starts right off with Bodacious Bounce, Half and Half, Gobbler, and climaxes with the thrilling Snowhole! After the whitewater morning, the afternoon will seem like a breeze with fewer rapids and lots of time to swim and enjoy the hot weather. Camp tonight will be another large beach where games of capture the flag and ultimate frisbee have been known to happen. Look forward to more delicious food, good wine, and plenty of time to relive the highlights of the day with your new friends, old friends, family, and the guides. Day 4: The final morning of paddling. A quick breakfast and you’ll be on the water headed towards civilization. As we continue down river the walls start to rise as we enter Blue Canyon, the steepest and deepest gorge of the trip. The Slide and Sluice Box will give you a great ride before you get to Eye of the Needle and the end of the Lower Salmon River. We meet the Snake River at the bottom of Hells Canyon, the deepest gorge in the country. At the confluence of the Snake and Salmon River say goodbye to your torpedo it’s time to load up on the jet boat. This two-hour ride, gliding down the river skimming past rocks and flying over waves, is the perfect end to an exciting vacation. The jet boat will drop the group in downtown Clarkston where a shuttle awaits to drive you the five minutes back to the Red Lion. Our multi-day trips are run by our partners at Orange Torpedo Trips, which means you can also choose to learn to paddle an inflatable kayak (from the world's experts, no less). This is a great way to get wet and actually paddle the river yourself If you or part of your group are more adventure oriented.